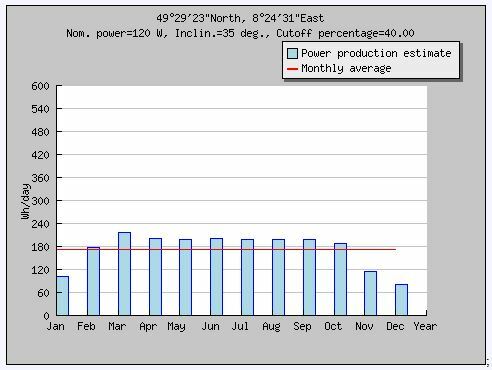 Undoubtedly, a garden house will need most electric power in summer, because this is the time where you have long, worm evening. In winter, if you really want to stay in the garden house, better to switch the lights of and hibernate anyway. 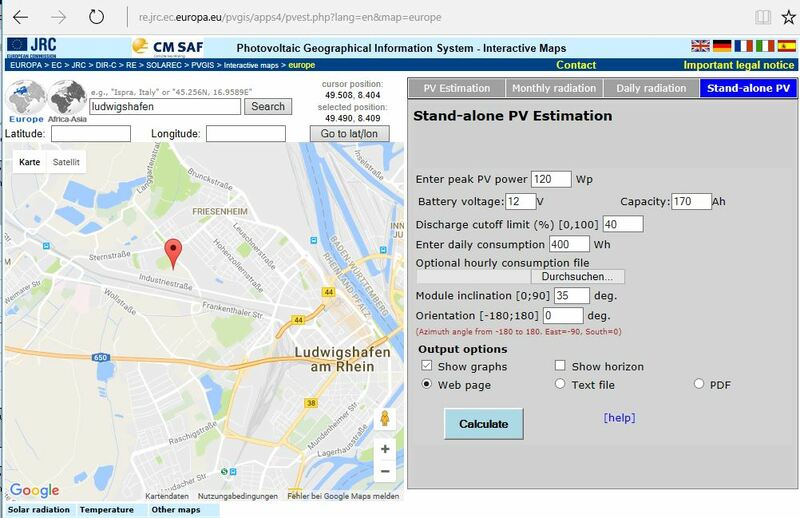 So, how much yield (kWh) do you get from a photovoltaic system, located in Ludwigshafen, Germany? 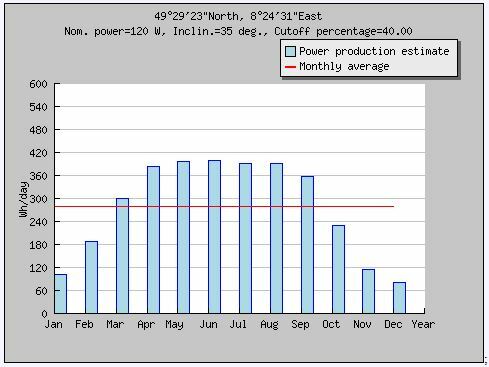 Well, there are very precise calculation models around, based on actual data. You only need to know the location, inclination and direction of the solar panel (and hope there is no shade!). For my location, about 8.4080 East, 49.4897 North, Orientation 192 degrees (SSW). 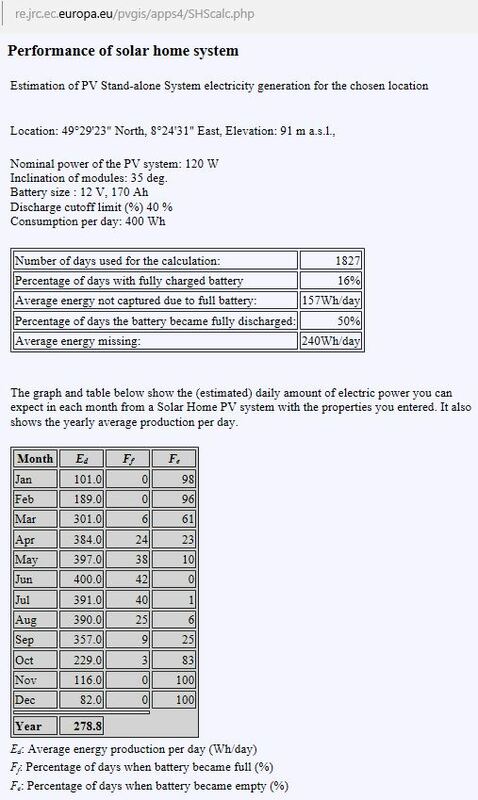 Then you go to Photovoltaic Estimation, and type in these numbers (select “stand-alone PV”). 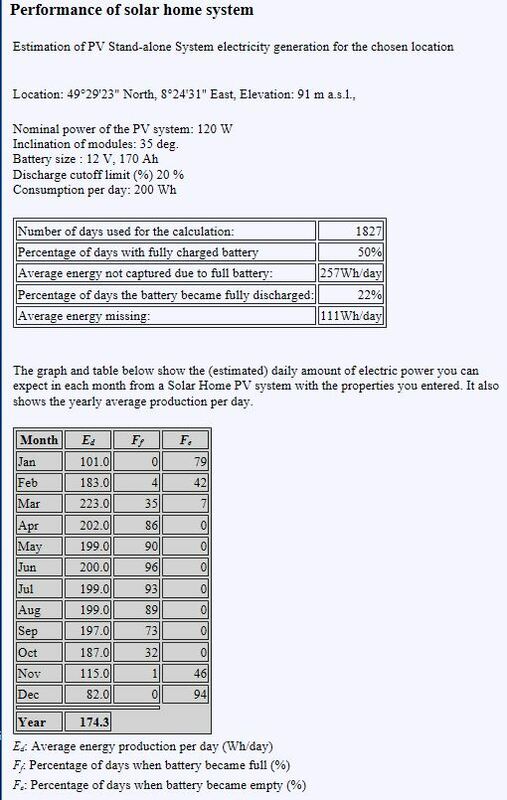 Also, you need to know the Wp rating of the the photovoltaic cells. 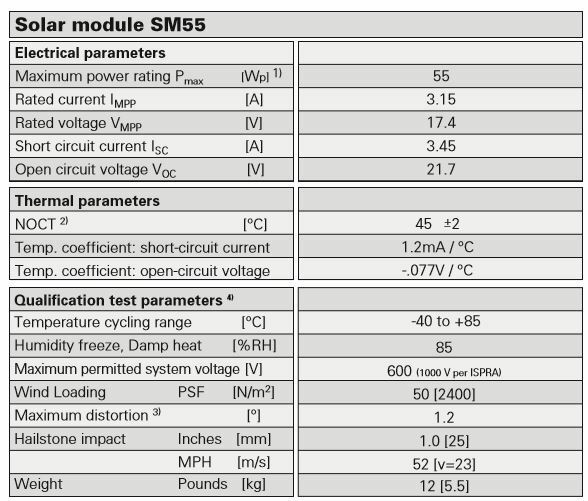 In the given case, we have 1 module “Siemens M55” (this has been around for a long time, datasheet of a current equivalent Siemens SM55 Datasheet), and a second one, quite similar, but slightly larger (need to find out the model number), all in all, 120 Wp estimated. The system also has lead acid batteries with total of 190 Ah capacity (C/100 discharge rate), but I just assume 170 Ah. Feeding the various data into the calculator, it’s a really great tool! Now, lets be wasteful and consume an average of 400 Wh per day. That’s enough to run some lights, and a sizeable fridge all day. A bit more conservative scenario, running an energy-efficient small fridge, and some lights (sure, you can also charge some cellphones or run a laptop computer). Now, lets check if the battery will running low – just changed the discharge limit threshold to 20%. 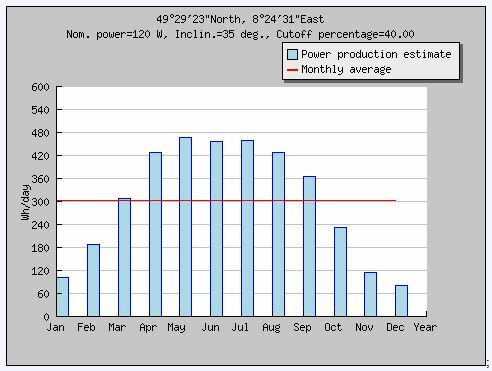 Still good, seems like we will have plenty of electricity during summer the summer months – in winter, we will just switch off the fridge, anyway, it is the best time for hot rather than cold drinks. For any standalone photovoltaic system, a battery is essential, because electricity is most needed when the sun is not shining. With all the many battery types around, lead acid type batteries still appear to be the best choice for a low-tech system in a harsh environment like a garden house. 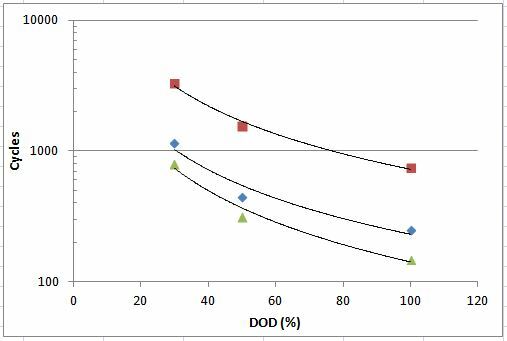 First, we need to understand that the cycle life of lead acid batteries strongly depends on the degree of discharge (DOD) per cycle. I.e., a battery rated as “120 Ah” would be only discharged by x% of its total capacity, and last much longer than with a full discharge every cycle. 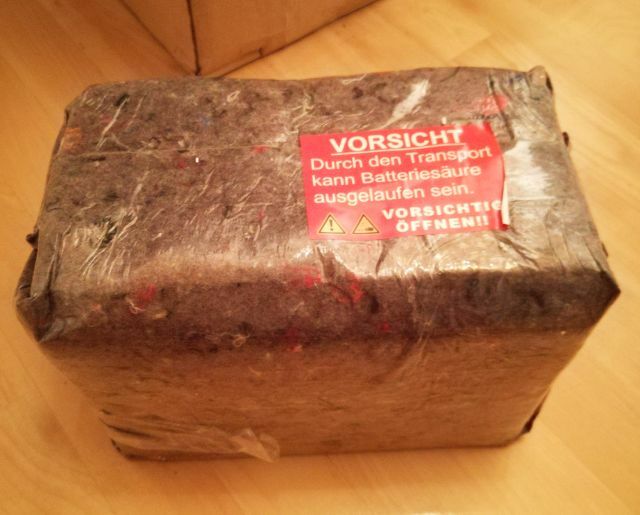 This is the battery we are talking about – quite impressive packaging, no wonder, because there is liquid sulfuric acid inside! 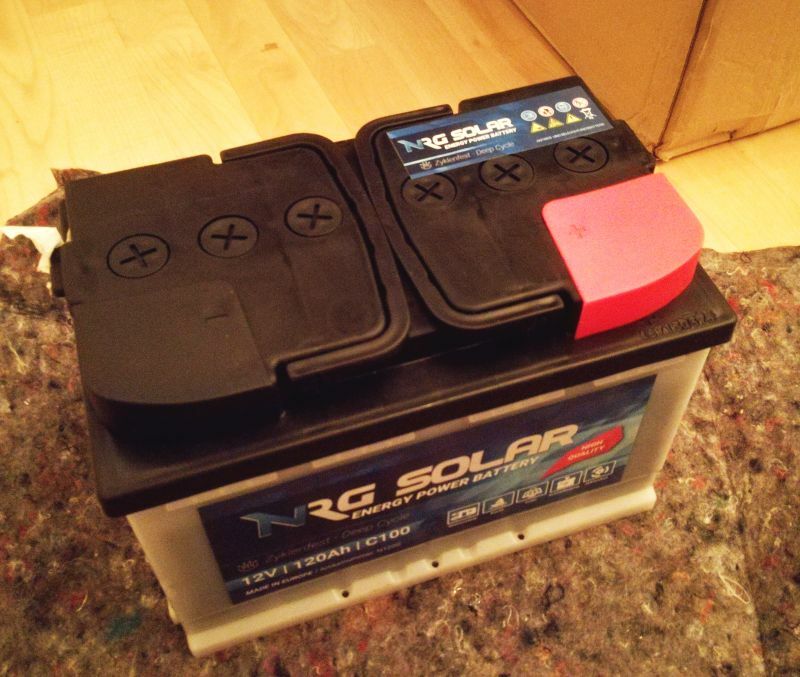 It is a N120S NRG Solar 12 V, 120 Ah, “Deep Cycle” battery. About EUR 75 if you buy it a the right spot. 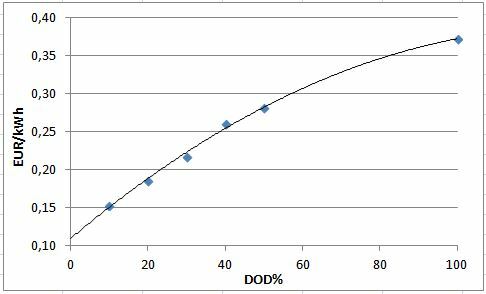 Some average life cycle data vs. DOD% for lead acid batteries. 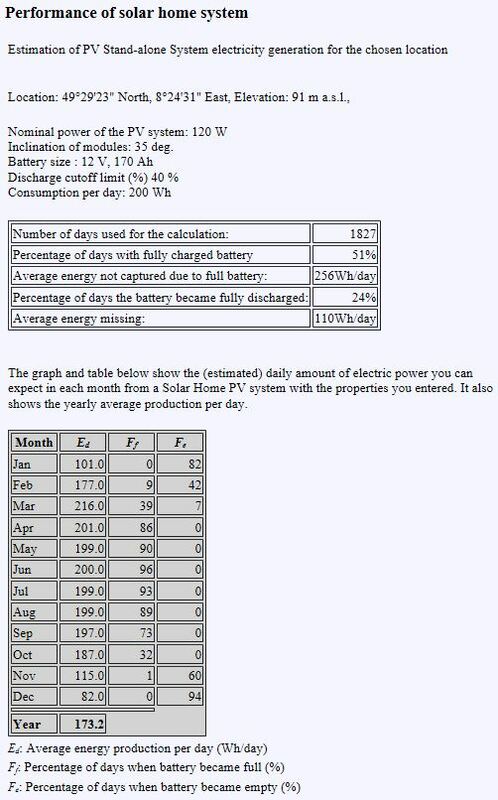 With cost, DOD%, etc, you can easily calculate the total energy stored over the cycle life of the battery. Time-wise, the battery can last about 8 years, at least according to the manufacturer’s data. So, with about 100 cycles maximum per year, one cycle per day (unless earth rotation will pick up dramatically…), no particular useful life beyond 800 cycles. With these data, it is quite clear that for the type of battery brand I am using (which is not the best most expensive super grade solar battery), running at 20~40% DOD will give quite OK life time expectancy, and cost even lower than domestic/grid power here in Germany, at least with the paid-off solar cells and charger. Sure, measures will need to be taken to avoid full discharge of the battery in winter, e.g., by disconnecting all major consumers, and just allow for some LED or fluorescent lights, and maybe, a few cellphone chargers. Allotment 44 (Parzelle 44): Gardening, rather than soldering! In these days of global trade, endless supply, and magnificent business opportunities, why not take a step back, and spend some time preparing the ground, in the the literal sense. This time of the year is great for such activities, and after several months of winter, working outside in the fresh air is certainly a recipe to keep good health and to enjoy life with family and friends. Long story short, after passing the formal application procedure and test, we are now the proud owners of a garden allotment, number 44. In German, Parzelle 44 (Kleingartenanlage am Riedsaumpark, Ludwigshafen am Rhein, Germany). The last owner could not maintain it for the last 2 years, so, it is in a bit desolate state, but nothing that can’t be fixed, and with these pictures being a few days old, it is now looking already much better. 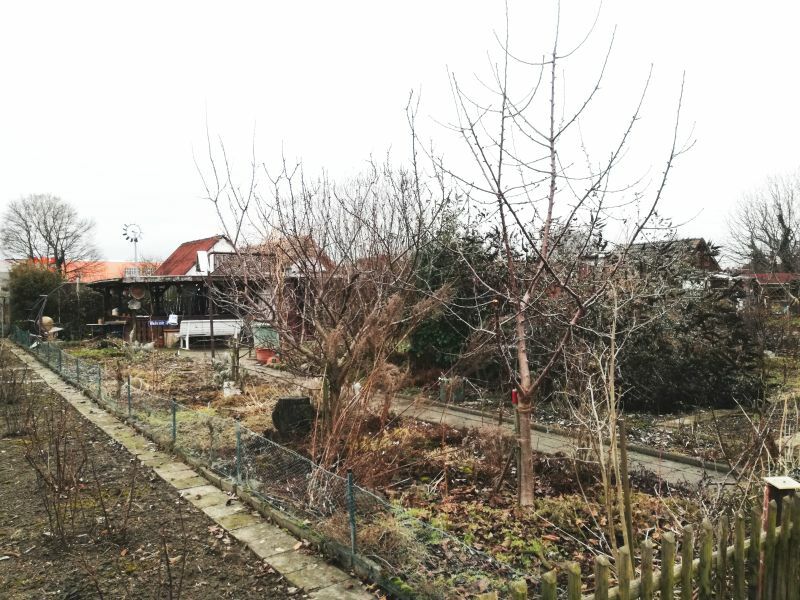 This a general view of the allotment, 300 square meters total, a bit over 3200 square feet. 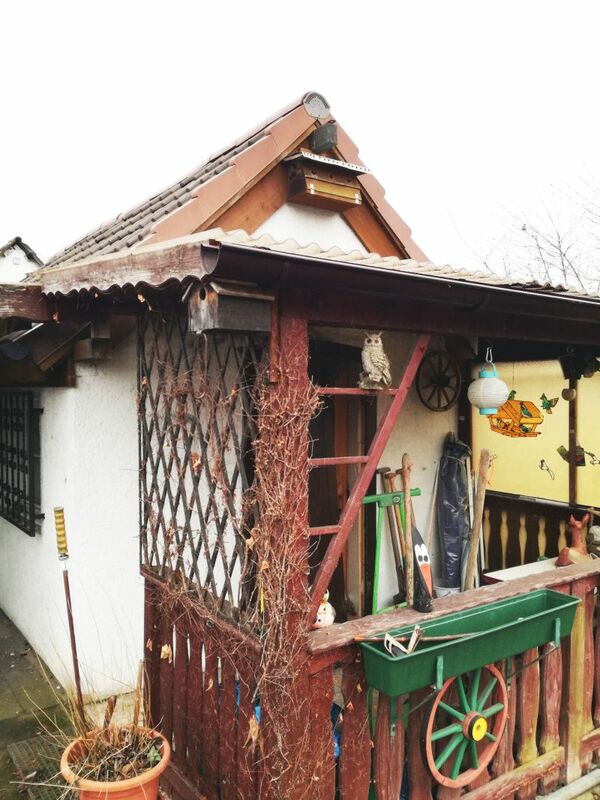 It also features several buildings: a garden house (stone-built, dry, and in good shape, just needs a bit of paint), a summer kitchen and workshop (wood frame construction, behind the house), and a tool shed (other side of the house), as well as a rather spacious patio. 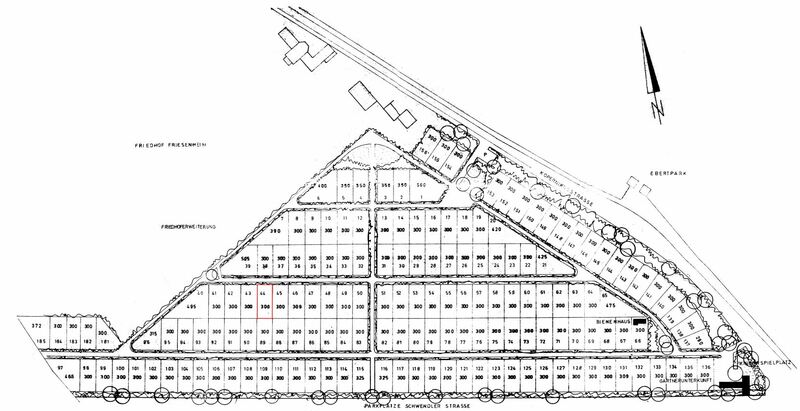 Enough space to stay there over the weekend, or to have extensive BBQ with a whole soccer team. Needless to say, it is a garden house, there is no connection to the power grid, or to a gas pipeline – at least, we have tap water! All else will need to be served by propane bottles, and by a photovoltaic system. Sure enough, no need to upgrade this to a too high level, with the main residence just a 10 minutes walk away, and we don’t want to defeat the purpose of it, to be a bit close to nature!